Summary: Slendertone has been the leader in EMS (electrical Muscle Stimulation) tech for many years. The Slendertone Arms Bicep and Tricep toner works using the same tech which has seen millions of abs (and some bottoms!) toned up. It works by stimulating the muscles thousands of times using electric pulses. This tones the muscles, adding definition. Note that you’ll need to buy 2 things to get this working. The pads (which are covered in depth here) and a controller unit, which is sold separately. You will find them both together, along with the gallery, detailed explanation of the tech and latest buyer feedback on this dedicated amazon.co.uk product page. What you will get are 2 special pads which you wrap around your arms and connect to a control unit. The ‘secret’ to this Slendertone product comes in the construction of 1000’s of tiny wires. These send phased pulses into your muscles. The pulses cause your muscles to contract rapidly – effectively giving them a vigorous workout. This is not an on-or-off thing, there are 99 different intensity levels to work through. A prerequisite for success is that the electrical pulses can reach the muscles. If not (for example you have a lot of fat on your arms), then the effects will be limited. In this scenario, I’d recommend losing some weight first, and then hitting the EMS later. You’ll need a controller unit. The arm toning pads will not work without one. This is not cheap, though will give you flexibility with your workouts. 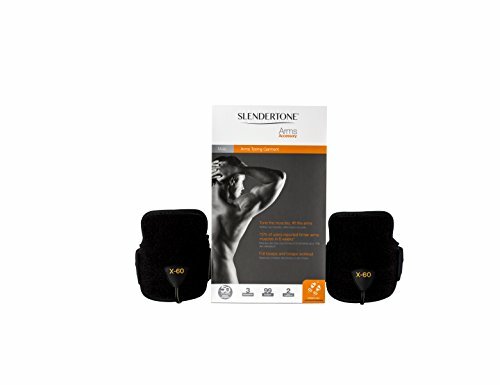 The Slendertone controller can also be used with Abs toning belts and with the new bottom toning product too. You will find this linked with the main arm muscle belts at amazon.co.uk. Overall, this unit has a lot of positive feedback. I will start with the negatives to present a balanced picture. There were a lot of stars lost due to the need for a separate controller unit. I agree with these comments, and can’t see why one is not included in the package. There were also some feedback suggesting ineffective treatment for larger people. As I mentioned above, EMS will not work well if the electric current can’t reach your muscles. A layer of fat will stop the current. Slendertone should mention this clearly on all of their products. They have excellent feedback on the whole, though larger users are often disappointed! For more background info on Electrical Muscle Stimulation, see my page on Do Toning Belts Work? Ok, on to the positives. This arm toning machine has a lot of fans! There is even some good advice about using your belt in conjunction with exercise (not instead of it). A lot of people saw visible effects within a couple of weeks. Wrap Up – Belt, Gym or Both? Of course, the best results are going to come for those users who hit the gym and use their EMS belts in conjunction with this. If you would like some definition in your arms, and fast (well, within a few weeks), then this could be the right product for you. Don’t take my word for it, check out the detailed user feedback in the comments section of this dedicated amazon.co.uk product page for yourself now!